Beginning on September 16th, students in grades 4 through 8 in Scott County schools will have the opportunity to learn the traditional music of the region in a new after-school program at Shoemaker Elementary School in Gate City. The program, known as Scott County JAMS – A Crooked Road / JAM Program, will provide interested students with instruction on fiddle, banjo, or guitar from traditional music instructors on Tuesday afternoons. The program will run from 3:30 to 5:30 p.m., and parents will pick up students after the classes end each Tuesday. Snacks will be offered as part of this program. 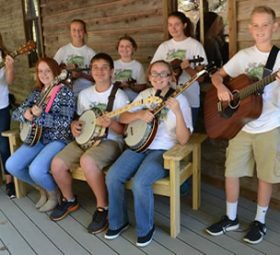 Scott County JAMS is modeled on offerings through Junior Appalachian Musicians, Inc. (JAM), which has similar programs in other areas of Virginia, North Carolina, and South Carolina. “These JAM programs and other similar traditional music programs have a proven track record of engaging students, building self-esteem, and providing them with very positive outlets for their creative talents,” said Sue Ella Boatright-Wells from Mountain Empire Community College. Students in Shoemaker Elementary School and Gate City Middle School will be treated to a preview of the program when stellar young musicians from WiseJAMS–Big Stone Gap, a Crooked Road/JAM program in Wise County, will perform in school assembly programs on September 4th to promote this new program. A Scott County JAMS program lift-off event will be held on September 16th at Shoemaker Elementary School. Parents of participating students and the press are encouraged to attend. The Crooked Road promotes economic development in Southwest Virginia by promoting the region’s unique heritage music. The Crooked has partnered with JAM, Inc. on six after-school programs in the region to date. Please contact The Crooked Road if your community in Southwest Virginia is interested in establishing an after-school traditional program. Scott County JAMS is funded in part by The Virginia Commission for the Arts, the National Endowment for the Arts, Rotary Club International, and the Scott County Board of Supervisors. 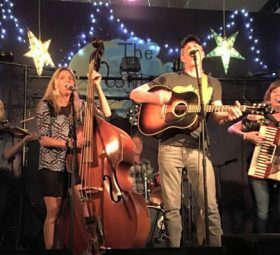 Additional support has been provided by The Crooked Road, Regional Junior Appalachian Musicians (JAM, Inc.), and Mountain Empire Community College’s Mountain Music School. Registration for Scott County JAMS is open until September 8th. Additional information about the program may be obtained by contacting Jennifer Frazier at Jennifer.frazier@scottschools.com or (276) 386-6118. Scott County JAMS seeks to preserve our important Appalachian mountain music heritage by offering low cost classes in fiddle, old time banjo, and guitar to small groups of students in an after-school setting. Classes will begin on September 16th, 2014 and will run through December 2nd, 2014 for the fall session. Classes will be held at the Shoemaker Elementary School on Tuesdays from 4:00– 5:30 p.m., and a snack will be provided at 3:30 p.m. Children will be required to attend all weekly classes. In addition, a non-mandatory Supervised Practice will be held every other Thursday beginning September 18th. Enrichment activities such as performances by guest artists, lessons in dance, singing and music theory, watching and listening to video and audio recordings, and taking part in field trips will be included as part of the program. Transportation from schools to the Scott County JAMS site will not be provided. Parents will need to pick up students from the Shoemaker Elementary School at 5:30 p.m.
Costs will be kept low. The fees include: $5/week for those students who receive free or reduced fee lunch at school; and $10/ week for all other students. We want all children to be able to participate in Scott County JAMS. If tuition costs are a problem, please contact us at the email address below. This fee helps cover the costs to operate this program. Instruments will be provided on a loan basis or low cost rental for Scott County JAMS students during the time of their participation in the program. In order to help us serve our area’s youth, we need to hear from you. If you, or someone you know, are interested in participating in Scott County JAMS, please contact: Jennifer Frazier at Jennifer.frazier@scottschools.com or (276) 386-6118.